London: Methuen & Co., Ltd. The text of this edition is in the public domain. Picture of Adam Smith courtesy of The Warren J. Samuels Portrait Collection at Duke University. The text of the present edition is copied from that of the fifth, the last published before Adam Smith’s death. The fifth edition has been carefully collated with the first, and wherever the two were found to disagree the history of the alteration has been traced through the intermediate editions. With some half-dozen utterly insignificant exceptions such as a change of ‘these’ to ‘those,’ ‘towards’ to ‘toward,’ and several haphazard substitutions of ‘conveniences’ for ‘conveniencies,’ the results of this collation are all recorded in the footnotes, unless the difference between the editions is quite obviously and undoubtedly the consequence of mere misprints, such as ‘is’ for ‘it,’ ‘that’ for ‘than,’ ‘becase’ for ‘because’. Even undoubted misprints are recorded if, as often happens, they make a plausible misreading which has been copied in modern texts, or if they present any other feature of interest. History, and was doubtless adopted from him by Adam Smith, though in the second of the two places where the name is mentioned inadvertence or the obstinacy of the printers allowed the usual ‘Cromwell’ to appear till the fourth edition was reached. I have been equally rigid in following the original in the matter of the use of capitals and italics, except that in deference to modern fashion I have allowed the initial words of paragraphs to appear in small letters instead of capitals, the chapter headings to be printed in a large size of upper and lower case roman instead of small italics, and the abbreviation ‘Chap.’ to be replaced by ‘Chapter’ in full. I have also allowed each chapter to begin on a fresh page, as the old practice of beginning a new chapter below the end of the preceding one is inconvenient to a student who desires to use the book for reference. The useless headline, ‘The Nature and Causes of the Wealth of Nations,’ which appears at the top of every pair of pages in the original has been replaced by a headline which changes with every chapter and, where possible, with every formal subdivision of a chapter, so that the reader who opens the book in the middle of a long chapter with several subdivisions may discover where he is immediately. The composition of these headlines has not always been an easy matter, and I hope that critics who are inclined to condemn any of them will take into account the smallness of the space available. The numbers of the Book and Chapter given in the margin of the original are relegated, with the very necessary addition of the number of the Part of the chapter (if it is divided into numbered parts), to the top of the page in order to make room for a marginal summary of the text. In writing this summary I have felt like an architect commissioned to place a new building alongside some ancient masterpiece: I have endeavoured to avoid on the one hand an impertinent adoption of Smith’s words and style, and on the other an obtrusively modern phraseology which might contrast unpleasantly with the text. The original index, with some slight unavoidable changes of typography, is reprinted as it appeared in the third, fourth and fifth editions, but I have added to it, in square brackets, a large number of new articles and references. I have endeavoured by these additions to make it absolutely complete in regard to names of places and persons, except that it seemed useless to include the names of kings and others when used merely to indicate dates, and altogether vain to hope to deal comprehensively with ‘Asia,’ ‘England,’ ‘Great Britain’ and ‘Europe’. I have inserted a few catchwords which may aid in the recovery of particularly striking passages, such as ‘Invisible hand,’ ‘Pots and pans,’ ‘Retaliation,’ ‘Shopkeepers, nation of’. I have not thought it desirable to add to the more general of the headings in the original index, such as ‘Commerce’ and ‘Labour,’ since these might easily be enlarged till they included nearly everything in the book. Authorities expressly referred to either in the text or the Author’s notes are included, but as it would have been inconvenient and confusing to add references to the Editor’s notes, I have appended a second index in which all the authorities referred to in the text, in the Author’s notes, and in the Editor’s notes are collected together. This will, I hope, be found useful by students of the history of economics. The Author’s references to his footnotes are placed exactly where he placed them, though their situation is often somewhat curiously selected, and the footnotes themselves are printed exactly as in the fifth edition. The Editor’s notes and additions to Smith’s notes are in square brackets. ** Critics will probably complain of the trivial character of many of the notes which record the result of the collation of the editions, but I would point out that if I had not recorded all the differences, readers would have had to rely entirely on my expression of opinion that the unrecorded differences were of no interest. The evidence having been once collected at the expense of very considerable labour, it was surely better to put it on record, especially as these trivial notes, though numerous, if collected together would not occupy more than three or four pages of the present work. Moreover, as is shown in the Editor’s Introduction, the most trivial of the differences often throw interesting light upon Smith’s way of regarding and treating his work. Lectures often enable us to say that a particular piece of information must have been taken from a book published before 1763. As it is known that Smith used the Advocates’ Library, the Catalogue of that library, of which Part II was printed in 1776, has also been of some use. Of course a careful comparison of words and phrases often makes it certain that a particular statement must have come from a particular source. Nevertheless many of the references given must be regarded as indicating merely a possible source of information or inspiration. I have refrained from quoting or referring to parallel passages in other authors when it is impossible or improbable that Smith ever saw them. That many more references might be given by an editor gifted with omniscience I know better than any one. To discover a reference has often taken hours of labour: to fail to discover one has often taken days. Wealth of Nations a convenient one to adopt in an economic encyclopædia. The book is surely a classic of great historical interest which should not be overlaid by the opinions and criticisms of any subsequent moment—still less of any particular editor. Much of the heavier work involved in preparing the present edition, especially the collation of the original editions, has been done by my friend Mrs. Norman Moor, without whose untiring assistance the book could not have been produced. Numerous friends have given me the benefit of their knowledge of particular points, and my hearty thanks are due to them. 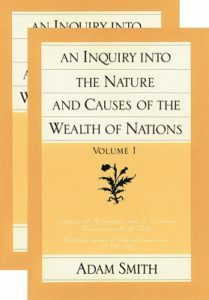 Wealth of Nations, based on the 5th and last edition published in Smith’s lifetime. The text and footnotes are presented here in full. The author’s original notes, color-coded blue in the text, are unbracketed and unlabeled below. The editor’s (Cannan’s) notes, color-coded gold in the text, are bracketed below. The website (Library of Economics and Liberty) Editor’s notes, color-coded red in the text, are unbracketed and indicated by asterisks rather than numbers. [Most modern editions are copied from the fourth edition. Thorold Rogers’ edition, however, though said in the preface to be copied from the fourth, as a matter of fact follows the third. In one instance, indeed, the omission of ‘so’ before ‘as long as’ at vol. i.